I have two Phrenology Head stamps that always seem very Steampunk to me. It was a very popular science a couple of hundred years ago and did reach its peak right around the time of the Victorians so it fits into the Steampunk era. I wanted to use different colors of green in the creation of this card and I used Claret as the complementary color for contrast. Did you notice the place that “ART” found on this map of the brain? Yes, you can see it right where it should be at the center of our thoughts. 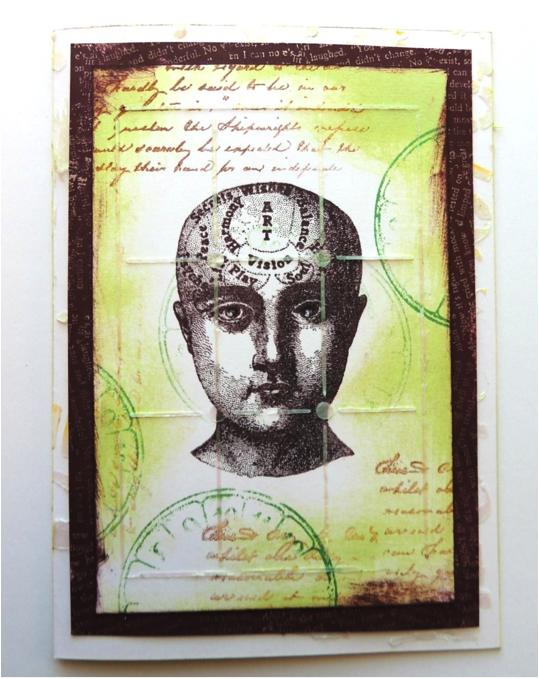 Stamp the Phrenology Head image using StazOn Claret ink. 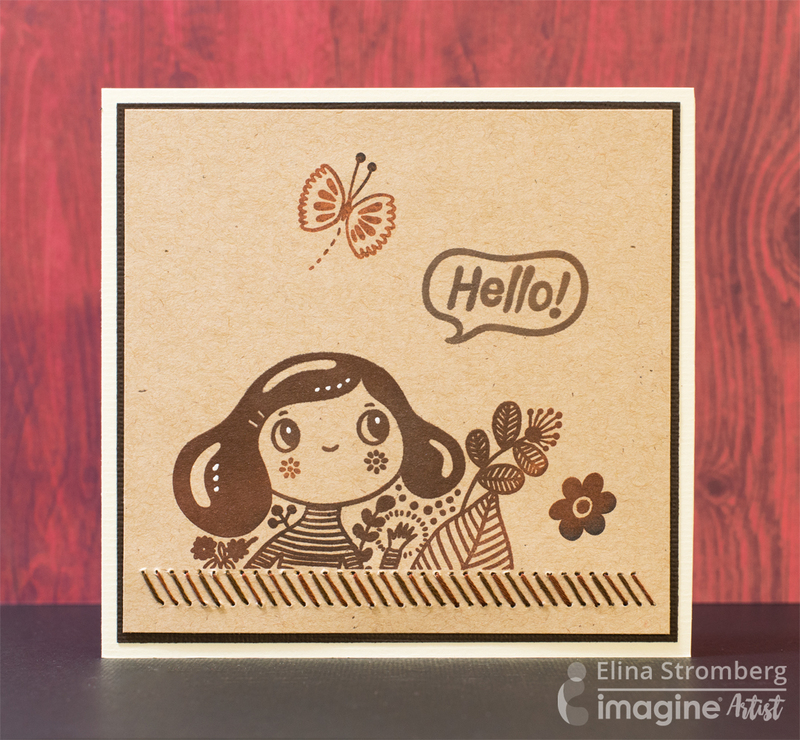 Using a sponge Dauber, start to color the edges of the stamped panel with Memento New Sprout ink, blending the ink toward the center in a circular motion. 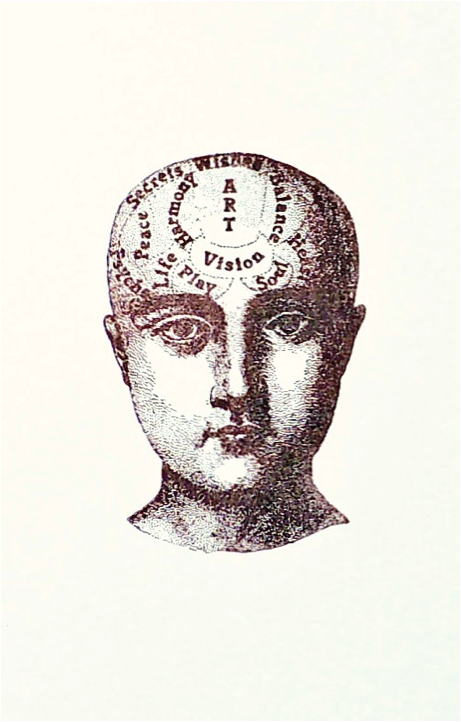 Since StazOn dry quickly and does not mix with water-based inks then do not worry about affecting the Phrenology stamp. Next, stamp a circularly shaped stamp around the edges using Delicata Emerald Green ink. Stamp script and ink the edges of the panel with StazOn Claret ink. Use Pam Carriker Rule of Thirds stencil on the front of the panel using Chartreuse Iridescent Creative Medium, spreading a thin layer with a palette knife. While the top panel is drying, ink the edges of a 4 ½” by 6 ½” piece of cardstock using StazOn Claret ink. Stamp text on those edges using Delicata Champagne ink, heat set with a heat tool. Taking the blank card that the panel will be adhered to, use a stencil and spread a small amount of Chartreuse Iridescent Creative Medium paste on the front of the card, allow to dry completely. When all the components are dry, assemble the card by placing the stamped panel onto the Claret colored panel, then adhere the entire unit to the stenciled card. Tear it Tape is a perfect tape to stack the components together on the card securely. When I was young my Grandmother’s favorite way to fix any problem in life was to have a cup of tea. As I’ve gotten older I still love tea time in the afternoon. This mini Tea Journal is for the tea lover in your life. There are spots to insert special bags of tea and small pages to journal about their must-have teas or maybe keep track of fun adventures with other tea lovers. Create a master board using Tsukineko’s Radiant Neon inks, your favorite stamps and a spray bottle of water, cut into 4” by 4” squares. Stamp a teacup image on the paper. 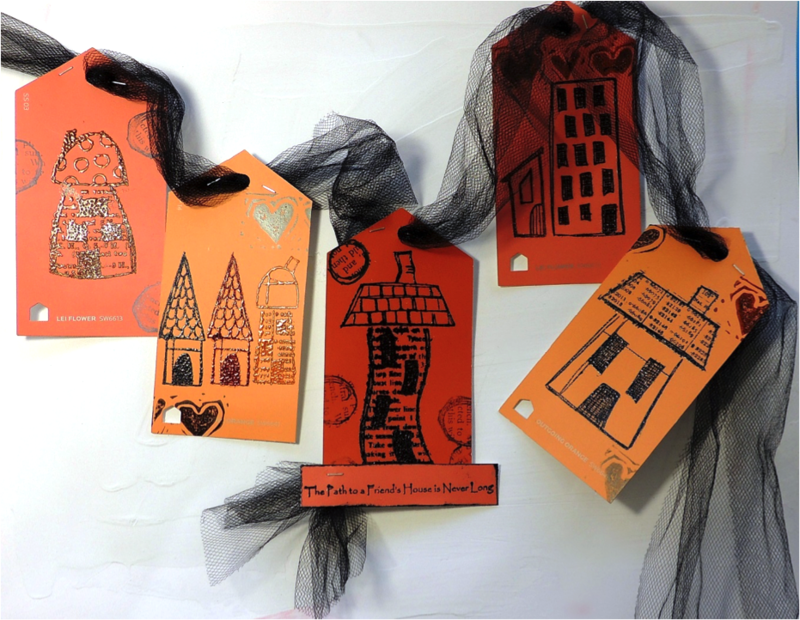 Use a Micron pen to decorate with doodled designs, color in with Memento Markers and ink from Radiant Neon inkers. Apply Shimmer Goosebumps on top of the colors on the teacup and allow to dry. Attach the decorated panel to a 4 inch square canvas. Make another teacup image and affix to a matching canvas. One canvas is for the front cover of the journal and the second one is for the back cover. Make additional teacup squares but do not attach to a canvas, these will be glued down inside of the journal. Cut a piece of Bristol paper to measure 4” x 16”, fold accordion style to create 4 inch sections. Attach the twine to tie the book closed underneath the folded piece of paper to hide the ends of the twine. Adhere to the inside of the canvases on either side using Tear It Tape. Small charms can be attached to one or both ends of the twine. 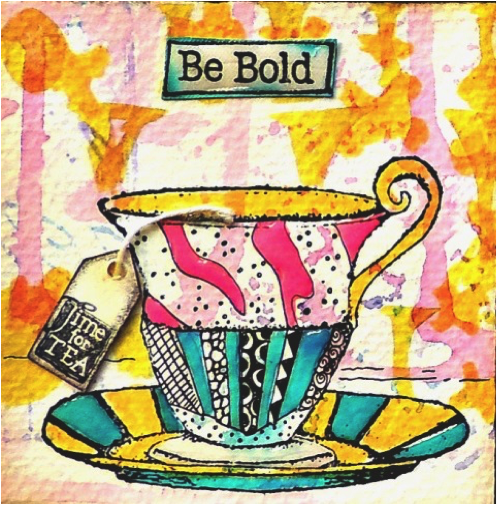 Create additional tea cups squares to include inside of the journal. These can all be made to look different by drawing designs on the stamped image or by using different colors, they can be matted or attached to a little hidden fold out book which becomes a journal within a journal. Adhere the extra teacup squares inside the journal. 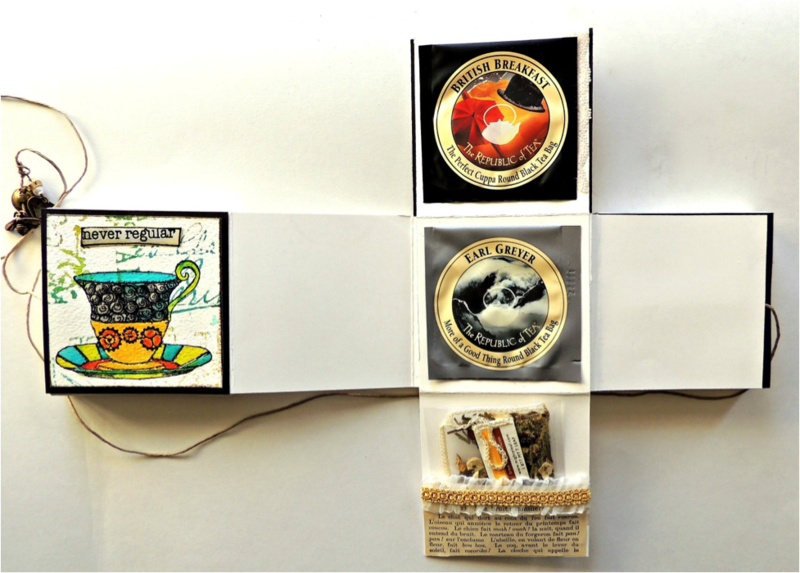 Teacup images can be on either side of the accordion fold, there is a front and a back that can be enhanced depending on how much ephemera there is to add in. Tea bags can include as a surprise. This can be considered a journal since there are blank pages within, these are waiting to include thoughts about favorite teas or favorite tea time adventures. When not in use fold the book up and tie the cord around it to keep it closed. The one thing I don’t miss in my life is snow. 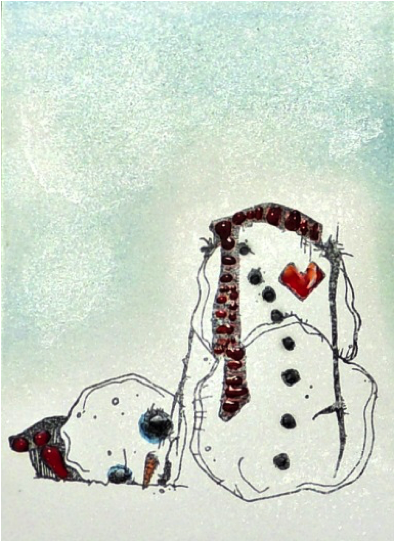 The closest I get to snow is stamping a snowman and some glittery snowflakes on a card. I think of my friends up north often and love to send them warm thoughts from South Carolina this time of the year when I know they’re pulling out their boots, scarves and winter coats. I hope they have fun building snowmen in the front yard! Stamp image on a piece of cardstock with Memento Tuxedo Black. Spray panel with Sheer Shimmer Spritz in Frost and let dry. Color in parts of the image with Memento Markers. 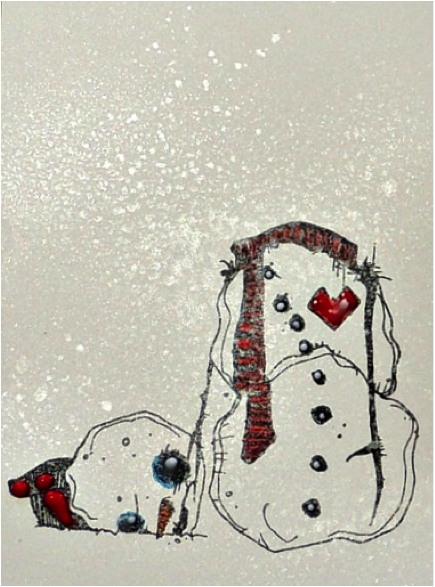 Apply StazOn Studio Glaze to heart, buttons, scarf, eyes, nose and hat. Color the sky with Memento Summer Sky and blend with a baby wipe. Dry with heat tool. 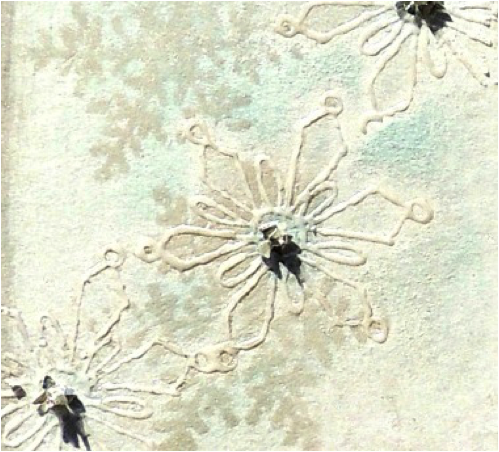 Stamp small snowflakes onto the background with VersaMark, then brush white Mica Powder over the snowflakes. 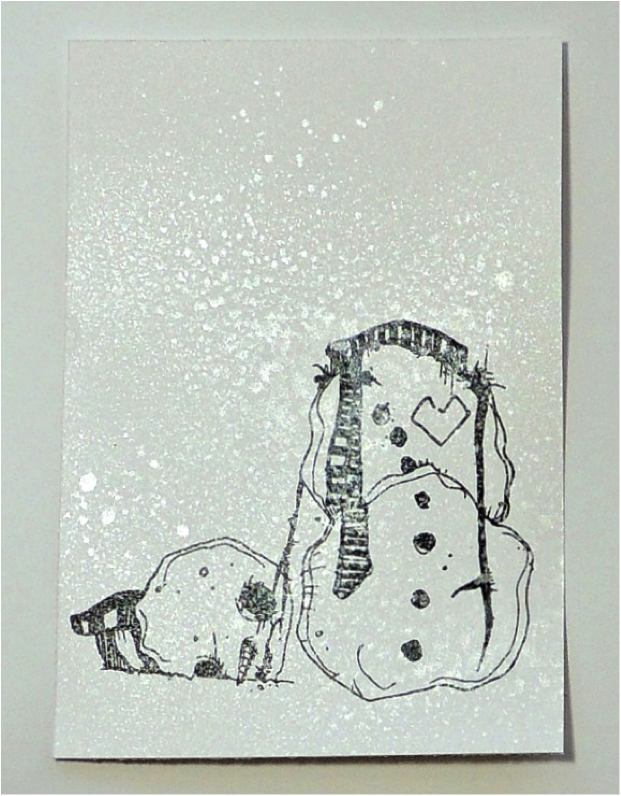 Stamp larger snowflakes on background againwith VersaMark, but apply clear embossing powder and melt with heat tool. Apply a small drop of On Point Glue to the centers of snowflakes and sprinkle a tiny bit of Glass Glitter to each spot. Ink edges with Delicata Silvery Shimmer. Adhere the decorated panel to black cardstock, patterned paper and attach to blank card. Tear a piece of scrap red paper and adhere to card. Tear a scrap piece of foil on top of the red paper. Stamp the phrase “Thoughts Of You Warm My Heart” on white cardstock scrap, ink edges, apply pop dots to the phrase and glue to the top of the foil piece. It doesn’t take much to create a quick housewarming project, a few discarded paint chips, some stamps and an old discarded piece of ribbon and you can put them to work. As baby boomers begin to downsize into smaller homes it is important to welcome Grandma and Grandpa to their new home with a friendly vibe. This paint swatch project is a great way to encourage recycling, nothing goes to waste, and to show support to those you love! Collect paint swatches and stamp different designs in various colors of StazOn ink on the chips. StazOn is a great ink for this project because it will stamp on the slick surface of the paint swatches. Also, because the surface is not very porous it takes the ink longer to dry and you can actually use StazOn to heat emboss. For this project, 5 different chips were used mixing different house stamps and adding additional stamps to the mix. If your paint chips are not the shape you want, cut to shape with scissors. Punch a hole in the top of each chip, string ribbon through the chips using a small stapler to hold the tags in place on the banner. Add little details to make the banner more interesting and personalized. 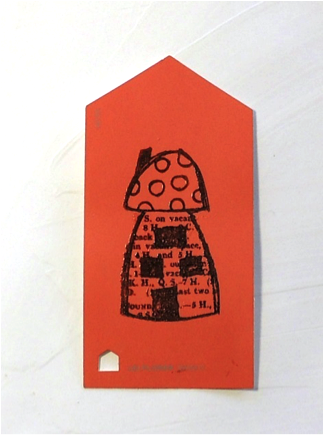 Since you are the creator then use a variety of color swatches and stamps to make it your own! Thank you for visiting the Imagine blog today and if you like this tutorial then comment below or share! Love is the topic of the day! Renee and Tenia have two great projects that respond to our challenge in November – Heart Felt. Life isn’t always rainbows and unicorns, there are times when we can send a friend or loved one a little reassurance that we’re thinking of them. By using Memento inks and a few drops of water we can create a one of a kind heartfelt card. 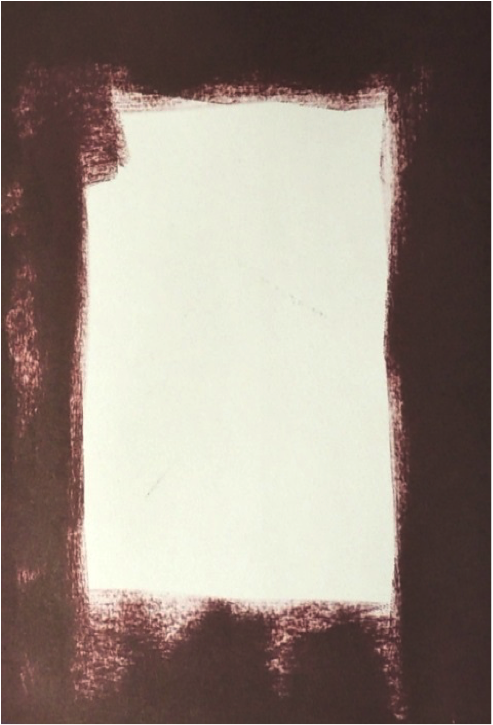 Using small daubers apply different contrasting colors of ink to a gesso primed piece of scrap paper. Apply droplets of water to the paper and blot with a kitchen towel. Measure the panel to desired size, this panel was cut to 4 ½” to 6 ½”, use a cutting tool to trim to size. Cut a piece of black card cardstock ½” larger than the panel, this will be the mat. Ink the edges of the panel with Paris Dusk Memento ink. Stamp hearts on pieces of scrap paper and cut out. Stamp phrase at the bottom of panel. Adhere the hearts to the panel using pop dots on the smaller heart to elevate it adding dimension. 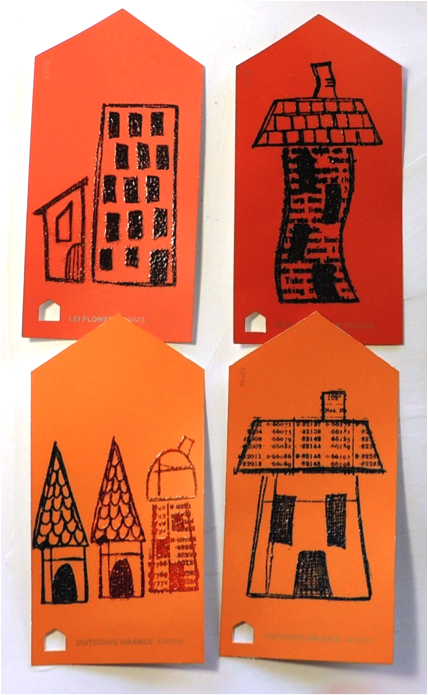 Add additional mark making stamping for interest. Use Tear It! Tape to adhere the panel to the black mat and then onto the blank card. 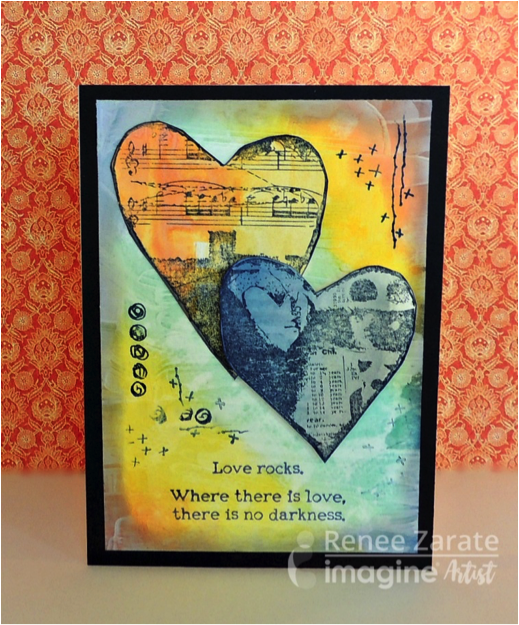 Tenia here from Jazzy Paper Designs with a watercolor card using Imagine and Tsukineko products. I love this large rose as the center image and the contrasting “love u” sentiment that compliments it. Here are some tips on how I created this lovely card. Stamp and heat emboss the large rose onto watercolor paper. 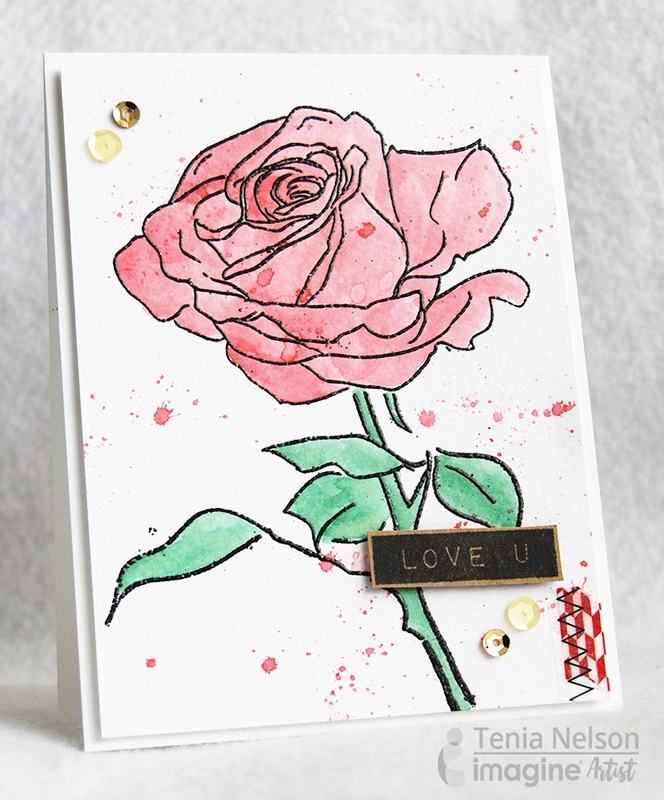 Create mask and stamp and heat emboss stem of the rose onto watercolor paper. The black embossing powder is a perfect compliment to the watercoloring technique. Watercolor image using red and green Memento markers. 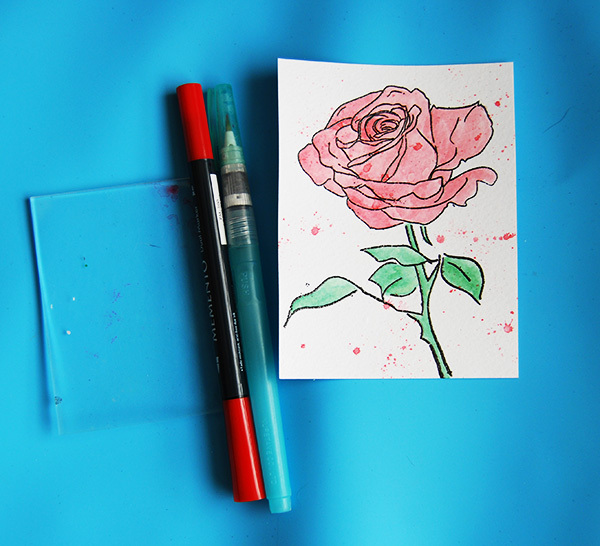 Lay down some of the ink onto an acrylic block and lift with a waterbrush. 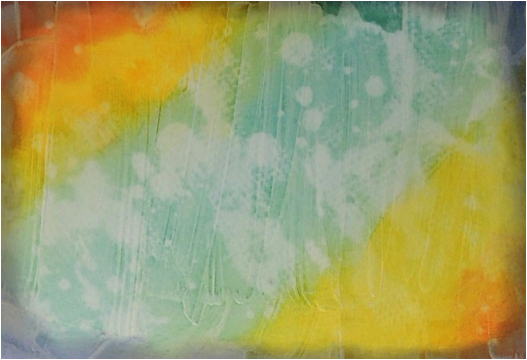 While you are finishing up the watercoloring, add splatter onto image panel with the remaining ink in the waterbrush. Stamp the “love u” sentiment onto Kraft cardstock and cut out with scissors. Adhere sentiment onto card along with washi, sequins and sticker stitches. Adhere image panel onto cardbase with another other finishing touches you prefer. Our November theme color is Chocolate Brown. Some paper crafters may think that a deep brown color is a boring choice, but when mixing several brown tones together you can easily create warm and beautiful project for every occasion. Stamping platforms and other stamping alignment tools let you re-stamp the image exactly on the same spot several times, so with this card design I decided to take advantage of this awesome tool. I mixed three brown colors and applied ink only partly on the stamp, allowing colors to mix and layer. When creating a multi-colored stamped image I suggest you start with the lighter colors and continue building layers with the darker shades. Adding a darker ink color on top of a light one is easy, but when stamping a light color on top of a dark ink may not change the dark base color at all. For this cocoa colored card, I used a light kraft cardstock as my background and layered several brown inks on my stamped image. The lovely image did not need too much additional decoration, but for continuing the idea of several brown tones I created a stitched border using two brown embroidery yarns. For making the beautiful browns pop, I added a hint of white with a gel pen. Then of course I mounted the kraft paper on the deep brown then altogether on a cream card base. Done! This is a monochromatic card that takes us back to a different time and place. All of us know someone we regard as a “hero”. How delightful to send a card and tell them how much we admire them and why. It might just make their day. Here is a quick run-down of how I made this card. 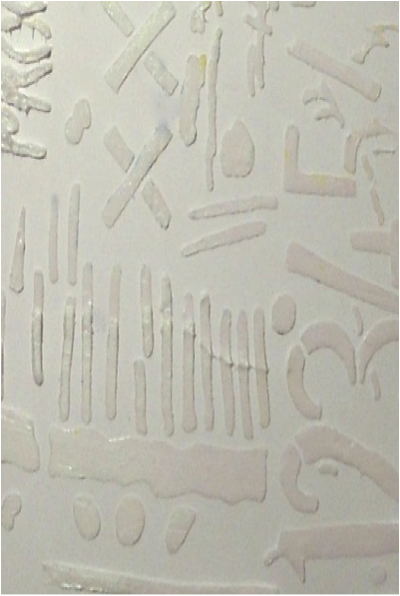 Stamp images on a panel measured to fit the card. 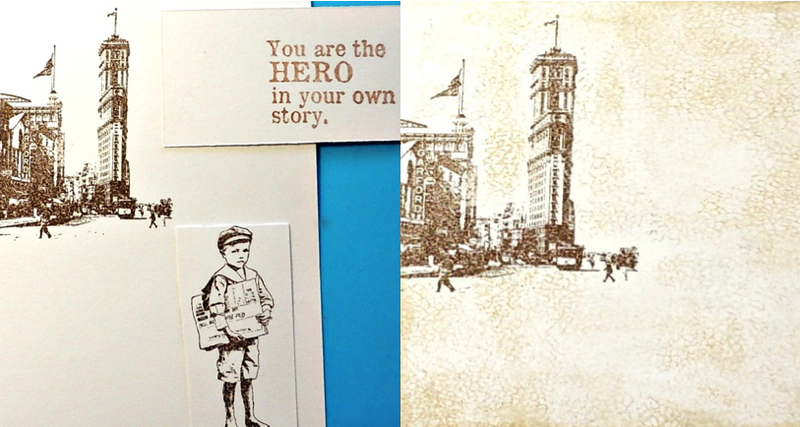 Use Rich Cocoa Memento for the city stamp and Celestial Copper Delicata for the hero sentiment. Stamp the crackle background with Champagne Delicata and heat set. Cut out the boy image and sentiment. Apply VersaMark to the stamped phrase panel and emboss with clear embossing powder. Distress the edge of this small panel with Memento pen in Espresso Truffle. Distress edges of entire large panel with Delicata Champagne and a small sponge dauber. Color in the boy image with Memento Markers. Create a ground for the boy with stamping additional marks and washi tape. Adhere the the phrase panel and boy image with pop dots. Use Tear It Tape to mount the finished panel onto black cardstock then to patterned paper and then a piece of cardboard. If desired, tie a ribbon or twine around the left side of the card.